I can think of nothing better than an early morning ride on a beautiful sandy beach. 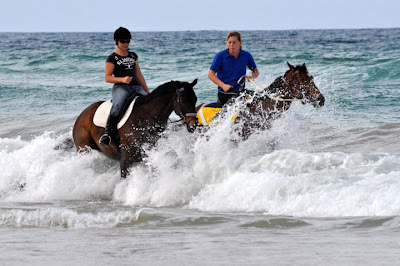 Friends of mine, Rebecca and Jess took their horses for an early morning workout on the beach recently. BC and Sporty loved it. I wonder if they were thinking how great it is to be alive and so full of energy. Rebecca is riding BC while Jess is riding Sporty. Sporty has the star on his forehead. The horses are in excellent condition. We, in Australia are very fortunate to have so many excellent beaches. Whilst not all beaches allow horses on them, there are some designated beaches that permit this. We also have beaches that allow dogs on them. It is obvious that they get great enjoyment from running along the sand and splashing in the water.